He was the hip-swivelling heartthrob who set pulses racing in Grease and Saturday Night Fever, but even John Travolta can’t defy the ageing process. The 57-year-old Hollywood veteran showcased the extent of his hair loss during an afternoon of tennis with friends in California. Taking a break from the sweaty workout, the Golden Globe-winner sipped on an ice cold drink and displayed his ever-growing bald patch. Hair today, gone tomorrow: John Travolta takes a break from playing tennis with a friend in California. The Scientologist is usually relatively coy about his thinning on top, opting for a hair piece when out in public. Just three months ago, Travolta sported a full head of hair while posing in front of a Breitling Jet during the 49th Paris Air Show in June. However, Travolta’s latest screen role sees him take on the life of John Gotti – a balding American mobster from The Bronx in New York City. The Look Who’s Talking star will fill Gotti’s shoes in a biopic about the crime underbelly of the Gambino family. It follows the relationship between Gotti and his son, John Gotti Jr, who chose to break away from the mob despite growing up in the heart of it. Art will imitate life as Travolta’s wife Kelly Preston will take on the role of Gotti’s wife Victoria. Known as the ‘Dapper Don,’ Gotti Sr’s flamboyant personality made him one of the most famous mobsters of the 20th century and he ruled the underworld until he died from cancer in 2002 while serving a life sentence. Rain Man director Barry Levinson will be the man behind the lens. Traction alopecia is hair loss caused by constant tension of braids and extensions on the hair, such as that created by an over-tight ponytail, plaiting or through using too tight rollers to style the hair. The action of pulling on the hair over a long period of time results in the gradual shrinking of the hair follicle and so the hairs produced become finer and finer and permanently damaged if not treated. Chemical trauma can be caused to the hair by bleaching, relaxing, perming or even dying the hair. The chemicals involved in these processes can damage the protein structure of the hair, making it brittle and often causing hair loss. As well as damaging the hair, these chemicals are also not good for the scalp and can irritate it. In order to treat hair loss effectively we would recommend that you have a diagnosis made as soon as possible by one of our experienced Westminster Trichologists. Stress can be an aggravator in almost all cases of hair loss and an accurate diagnosis will always, at the very least, take some of the stress away from you. 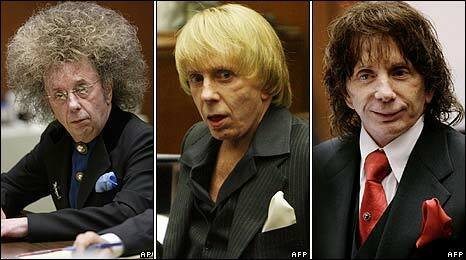 A prison photograph of Phil Spector has offered a rare view of the jailed music producer without one of his many wigs. The mug shot, taken on 5 June, shows a gaunt, bald-pated man with long stringy hair on the sides of his head. 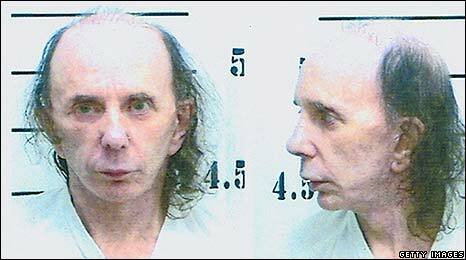 Spector, 69, was sentenced last month to 19 years to life for killing actress Lana Clarkson at his home in 2003. Over the course of two trials the “Wall of Sound” pioneer turned heads with his flamboyant hairpieces – forbidden in US prisons unless medically necessary. “They took my husband’s freedom and dignity. So why not his hair?” said Spector’s wife Rachelle. Spector is being processed and evaluated at North Kern State Prison in Delano, California before being sent to his final prison destination. The photo was released by the California Department of Corrections and Rehabilitation as part of its policy of transparency in public information. Spector was given a retrial this year after the jury in his 2007 trial failed to reach a unanimous decision. In his 1960s heyday he produced dozens of hits, including The Ronette’s Be My Baby and The Righteous Brothers’ You’ve Lost that Lovin’ Feelin’. By the mid-1960s, Spector was much in demand as a producer, working with The Righteous Brothers and contributing to The Rolling Stones’ debut album. Oprah: "I Don't Wear a Weave!" Remember that to grow long and healthy Black hair, you have to condition it. Do not neglect this. Black hair that is not conditioned often is dull, brittle, and damaged. Do not purchase cheap products with hair stripping ingredients, such as sulfates, alcohols, glycols, and silicones (any ingredient ending in the word “cone”). This eliminates about 96% of black hair care products available on the market. Always buy when possible “The Hair Centre” recommended range of Trichologically Balanced Treatments and Products especially designed for Black African Hair Loss Problems and Damaged Hair. The Average Black African Woman spends an average of £185 a month [ including damaging WEAVES and HAIR EXTENTIONS ] on all the wrong products designed and targeted at the Modern Black African Woman. With the Correct Trichological Advice and Trichologically Balanced Treatments and Products specifically designed for you, you can indeed enjoy a full healthy head of beautiful hair in any style you chose at a fraction of the cost. 4 Jun 2008 … Supermodel Naomi Campbell is going bald because she has been getting hair … London Trichology Clinic), TRICHOTALK by Gary Heron Trichologist.